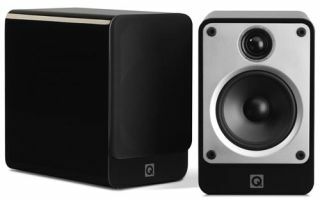 Q Acoustics launches new Concept 20 speakers | What Hi-Fi? The £350/pair speakers use a brand new cabinet design that claims to address "the fundamental problem of distortion caused by cabinet resonance"
Q Acoustics has today announced the launch of a brand new loudspeaker, the Concept 20. The Q Acoustics Concept 20 standmount speakers are £350/pair, due to be officially launched at the Bristol Show, and will come in white and black. A 2-way reflex speaker, the Concept 20s use a 125mm bass driver and a 25mm tweeter. They stand 26cm tall, by 28cm deep and 17cm wide, and weigh 5.6kg. The company claims to have addressed the fundamental problem of distortion caused by resonance, with a completely new design. The cabinets incorporate "Gelcore Construction". Described as "a cabinet within a cabinet" and promising ultra-low resonance. Q Acoustics claims the design means a reduction in radiated power – which in turn leads to colouration – of more than -6dB to midrange frequencies. In the high and low frequencies, the effect is said to be even greater. The product has a choice of two finishes, gloss white or gloss black, and has a UK suggested retail price of £350 per pair. Q Acoustics will be showing off the Concept 20 speaker for the first time at the The Bristol Show (22nd to 24th February). The speakers are due on sale in mid-March.